Rigatoni all’Amatriciana. 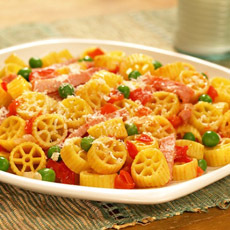 Photo courtesy of BarillaUS.com (the recipe is on the website). the appropriate page of the glossary. The Italian word for “radiators,” radiatore (rah-dee-a-TOE-ray) are short, chunky pasta shapes about 1 inch by 1/2 inch, with ruffled ridges that radiate out. One of the more elegant pasta shapes, they look great sauced or in casseroles, salads and soups. A ragù (rah-GOO) is a meat-based sauce. The Italian word derives from the French ragoût, from the verb ragoûter, “to revive the taste.” A ragù is usually made by adding meat to a soffritto, a mixture of chopped onions, celery, carrots and seasonings (garlic and fresh herbs such as parsley or sage), that is partially fried in olive oil. (A soffritto is the progenitor of the French concept of the mirepoix.) It is then simmered for a long time with tomato sauce. Ragù can be made with any meat or game. Ragù alla bolognese (sometimes known as Bolognese sauce) is made with ground pork, beef and pancetta. Ragù alla Napoletana (Neapolitan ragù) includes sliced beef, raisins and pine nuts. CHOCOLATE PASTA? CURRY PASTA? TANGERINE PASTA? Ramen are Japanese wheat noodles. While they are known to Americans largely as salty, inexpensive packaged noodle soup mixes, in Japan there are as many varieties of noodle and recipes as there are prefectures, ramen dishes are fine cuisine and innovation is the name of the game, where recipes are closely-guarded secrets. Pasta pillows stuffed with a variety of cheese, meat, seafood or vegetable fillings. Ravioli (rah-vee-OH-lee) can be circular or square; specialty shapes like hearts and fish are also made. They are served with butter or olive oil, sauce or in soups. Here’s the history of ravioli. 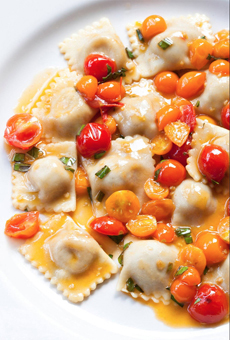 Read reviews of some of our favorite ravioli. A lasagna made by layering ravioli instead of lasagna noodles, complete with all the traditional lasagna ingredients. Here are photos and recipes. Miniature raviolini. These can be served as a pasta dish, hors d’oeuvres or put into soup, like won tons. 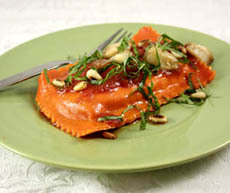 Ravioli with cherry tomato sauce. Photo courtesy Delfina restaurant. Large ravioli (rah-vee-oh-LOE-nee). They can be as large as three-inch circles and four inch squares or rectangles (you can see that the piece at the right is almost as long as the fork). One piece suffices a first course, or two pieces as a main dish. The best ones have interesting fillings, beyond the normal vague meat, cheese and vegetables. The ravioloni here, from Nuovo Pasta (a NIBBLE Top Pick Of The Week) is filled with spicy sausage, escarole and roasted garlic. Photo by Ryan Clark. Read the full review of Nuovo Pasta. 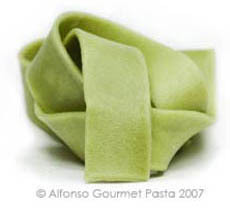 As opposed to round pastas like spaghetti, ribbon pastas are flat strands. They are made in varying lengths, widths and thicknesses, from delicate linguine to the mid-width fettuccine and tagliatelle to the wide pappardelle to the widest, the two-inch-wide lasagne. 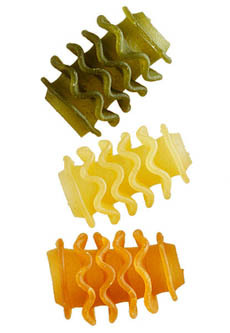 Ribbon pasta can have straight or wavy edges. It can be purchased fresh and dried. Thai noodle dishes, such as the famous Pad Thai, are made from rice sticks. These are vermicelli-shaped thin strands that are made from rice flour and water, instead of wheat flour. Because the noodles are stir-fried, not boiled, they must be soaked in warm water for an hour prior to cooking. They are also available in a wider form for other dishes. Medium-width lasagne noodles with frilled edges. Pronounced REE-cha LAHR-ga.
A somewhat skinnier, smaller version of rigatoni (ree-gah-tone-CHEE-nee). The size and density of these ridged tubes are best suited to thick, clingy sauces. This cut also works well with al forno-style preparations. Artisanal rigatoncini by Rustichella d’Abruzzo are available from SalumeriaItaliana.com. 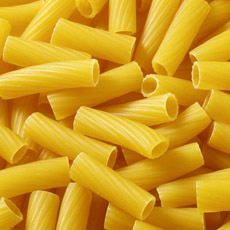 The most commonly used cut in southern and central Italy, rigatoni (rih-gah-TOE-nee) are large, ridged, slightly curved tubes of pasta with square-cut ends. The name comes from the Italian “rigato,” the past participle of “rigare,” to draw a line. They are excellent for chunky meat sauces and cheese sauces because the ridges, or grooves, catch the sauce. The large diameter of rigatoni tube, as well as the penne and mostaccioli tubes, make them ideal to catch pieces of meat or vegetables in the sauce—the entire surface, both inside and out, works to adhere the sauce. The difference between rigatoni and penne is that penne have angle-cut ends. 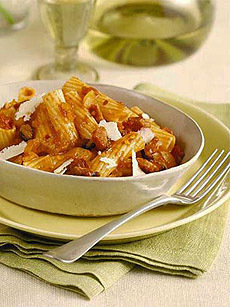 See the photo of Rigatoni all’ Amatriciana at the top of this page. A famous preparation, it includes a sauce of plum tomatoes, crushed red pepper flakes, pancetta or bacon, and grated Romano cheese. Originating in northern Italiy, rotini are “spirals” or “twists” shorter than fusilli, about 1-½ inches long, with a tighter spiral that helps retain the local pesto sauce better. They are popularly used in pasta salads as well. Small, spoked, wheel-shaped pasta. Ruote (RO-tay with a uo dipthong) means wheels in Italian. Ruote, or wagon wheels. Photo courtesy of BarillaUS.com.